People walking past the Town Hall over the summer may have noticed some new additions to the flower beds outside by a local artist. Beautiful hand-painted butterflies were installed by local artist Magdalen Rubalcava to brighten up Brixton and ‘make people smile’. Magdalen, who is well known locally from her work at Brixton Windmill, was supported by Brixton Hill councillor Adrian Garden and Veolia in the project. She made almost 100 butterflies by hand in various materials, building up to a grand Butterfly Finale ahead of the closure of the Town Hall for refurbishment. 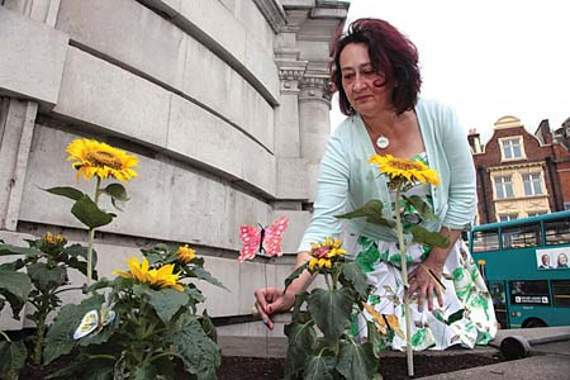 The butterflies, which featured in the South London Press, are now moving to other locations in Lambeth and will be auctioned off for FoodCycle. This entry was posted in Blog and tagged Acre Lane, Adrian Garden, arts, Brixton Hill, Town Hall by Martin Tiedemann. Bookmark the permalink.